Montblanc’s releases during 2018 are focused into three lines: the 1858 collection, the TimeWalker collection, and the Star Legacy collection. Today, we are looking at the first of these. As well, this year marks the 160th birthday of the ‘Minerva’ part of the Montblanc watch family. This year’s new additions to the 1858 collection has been characterised by the launch of five new pieces : the 1858 Automatic, 1858 Automatic Chronograph, the 1858 Geosphere, the 1858 Monopusher Chronograph Limited Edition 100, and the 1858 Pocket Watch (LE 100). 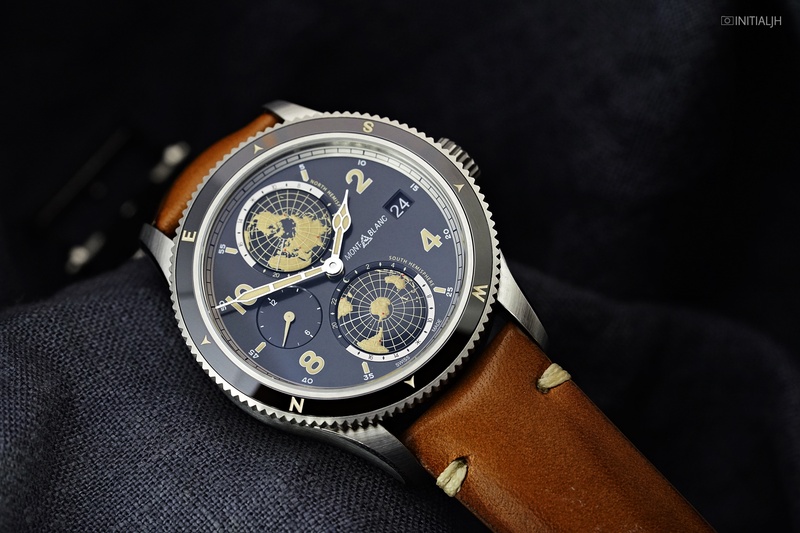 Montblanc chooses a theme every year, and for 2018 it is mountain exploration, so today’s post is a look at the 1858 Geosphere. It is dedicated to the Seven Summit Challenge, in which participants have to climb the highest mountains in each of the seven continents. On the Geosphere, this is noted by means of red dots on the hemispheres to mark each mountains. The rotating bezel marked with compass points provides another link to the notion of exploration, but there are no specifically mountain-related functions such as an altimeter. Powered by the 4Hz (28,800VPH) Calibre MB 29.25, (Sellita base, to which a world timer complication developed by Montblanc has been added), the new Geosphere features two domed rotating hemispheres which rotate fully every 24 hours. The northern hemisphere at 12 o’clock turns anti-clockwise, whilst the southern hemisphere turns clockwise. They are both surrounded by a scale with the 24 time zones, along with a day/ night indication. The longitude reference meridian for both hemispheres is highlighted with a white line coated with Super-LumiNova, but there are no indications for cities. A second time zone display is shown on a sub dial at 9 o’clock, and the date, linked to the local time, is at 3 o’clock. One unusual feature of this watch is the absence of a second hand. The cathedral-style hour and minute hands, indices, numerals and continents, all feature the use of Super-LumiNova. Along with the date window at 3 o’clock there is also a second time-zone display is situated at 9 o’clock. The watch comes in two iterations, either a 42mm (12.8mm thick) stainless steel case or a limited edition (1858 pieces) titanium-bronze case. Both feature polished and satin-finishing and fluted crowns with the Montblanc logo in relief. The bi-directional bezels are stainless steel or bronze respectively, filled with glossy black ceramic, fluted on the flank for a better grip, and as mentioned earlier, feature four engraved cardinal points. Water resistant to 100m, the case backs of both models feature a thematic engraving commemorating the Seven Summits Challenge. They come on a choice of three leather straps made by Montblanc’s Pelletteria in Florence; a black NATO, a cognac-coloured calfskin strap with contrast stitching, or a Bund-style strap. The RRPs for Montblanc 1858 Geosphere are 5,190 EUR for the stainless steel version and 5,890 EUR for the limited edition bronze model. 14 May 2018 Postcript – an Australian climber has just completed the Seven Summit Challenge in record time (117 days), less than 3½ years after breaking his neck in a bodysurfing accident. Click here to read a news report about his feat.